From collagen drinks like Dirty Lemon’s [Skin+Hair] to collagen supplements like Youtheory, Reserveage and Vital Proteins, there’s a sea of options to choose from. Or you can abide by a collagen boosting diet with supplements like Beauty Chef’s Collagen Boost, which doesn’t contain collagen, but supports collagen development. It’s pretty confusing. And all of them claim to boost your skin’s natural anti-aging abilities, others claiming to support all-around beauty, prevent joint pain, and build muscle or protein. We all know we want collagen (because it’s disappearing at a rapid pace as we age), but how do we know these supplements work? How do you buy them? How do you read these labels? What do you need to know? Collagen starts to break down in early adulthood, and then the quest to replace it begins. But the collagen we put on our faces and the collagen we consume is not human; it’s usually from animals, and most often from fish. People have shown an aversion to using cow, pig, or chicken-derived collagen, so you may often see a clarification on labels that the collagen is ‘marine,’ or fish-derived. Technically, there are 28 types of collagen (defined and researched so far), but of the five most common, only three are used for topical or ingestible beauty products: Types I, II, and III (creative names, right?). This article by Stephen Daniels, “The Science of Nutricosmetics,” helps to clarify the types a bit: Type II is formed in cartilage (usually chicken) and Types I and III are formed in skin, tendon, scales and bones of all the above-mentioned animals. Whatever the type, collagen is either kept in the whole protein form (unhydrolized)—which is, according to most studies, too large to be absorbed through the skin—or hydrolized, which means, loosely, the proteins are chopped up into smaller pieces. For that reason, most topical and ingestible collagens are hydrolized: they’re supposedly more easily digested and absorbed in this smaller form. To put it plainly, you’re eating a bunch of expensive collagen proteins and it’s being acid-washed in your stomach and broken down into tiny pieces that may or may not be doing any good whatsoever. So: should you pour everything down the drain and flush everything else down the toilet? Is there a positive tilt to this? 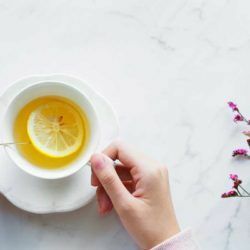 Actually, there are several current studies favoring collagen as a useful supplement, but understanding the dosage and alternate factors involved is also important. Zak Normandin, CEO of Dirty Lemon, shared this 2013 study with us, which shows that after 8 weeks with a dosage of hydrolized collagen as low as 2.5g daily, positive changes are seen in women 35-55 years old: elasticity, in particular, was measurably improved (in the elderly women; not in the younger women). Skin moisture improved, but not to a statistically reportable degree. Zak Normandin also told us that each bottle of Dirty Lemon [Skin+Hair] contains 2g of collagen—he did not respond to further inquiries asking why this collagen content isn’t listed on the bottle, and why they decided to include just 2 grams of collagen rather than 2.5 or more, to reflect the findings of the study referenced. At almost $11 per bottle ($65 for 6) you would need to spend over $20 daily to get just 4g of collagen. This recent clinical trial, on the other hand, gave groups of women aged 40-65 in France and Japan an increased dose—10g—of hydrolized marine collagen daily for 8 weeks. Results were positive, and included not only improved elasticity, but a higher statistically reportable moisture content. So if you do believe in collagen supplements, you need to pay close attention to the dosage. That’s key. “With type I & III collagen, you really need to consume >6g at a time to be effective,” says Joyce Longfield. To hit Joyce’s recommended minimum collagen consumption, you would need to drink three bottles of Dirty Lemon [Skin+Hair] per day. That’s over $30 worth of supplements. Products like Reserveage Collagen Chews have 2.5g of marine collagen per chew, in addition to hyaluronic acid—the recommended dosage is 3 chews per day, which brings your daily allotment to 7.5 grams. 60 chews are $21, so for about one dollar per day you’re receiving more than Joyce’s recommended minimum. In response to the above referenced studies, experts asked: yes, we see collagen going in, but is it the collagen making the difference? How closely were participants’ diets controlled? What was their water and alcohol intake like? Corina Crysler, nutritionist and Co-Founder of GliSODin Skin Nutrients, told us “Elasticity would be the main objective when taking a collagen supplement. Hydration could come from many other things, even the time of year. I feel more data is needed as there is a lot of clinical work that suggests it doesn’t work due to the structure of collagen and its bio-availability.” GliSODin Skin Nutrients anti-aging supplement focuses in Hyaluronic acid, Omega-3s and other boosting supplements, rather than actual collagen. Following this line of thinking, Longfield also notes that it would matter how soon after taking collagen the participants ate food or drank water, as this can impact the digestion of the collagen protein. Given all the uncertainty around collagen supplement effectiveness, many experts say that the best way to build more collagen and protect what you already have is two-fold: use sunscreen of course (because UV rays break down collagen) and eat well while focusing on the collagen building blocks, not collagen itself. And if you want to take supplements, focus on taking collagen-building supplements, not just on collagen protein. If you’re looking for an additional boost—beyond the old-fashioned sunscreen and apple-a-day-method—there are ways to boost collagen production without actually eating collagen. Most of the experts agree, concentrating on eating the building blocks of collagen so your body has the tools it needs to preserve the collagen it has and produce more is the best way to go. Products like GliSODin Skin Nutrients anti-aging supplement and Beauty Chef’s Collagen Inner Beauty Boost are perfect. Carla Oates, the creator of Beauty Chef supplements, doesn’t include collagen in her Collagen Inner Beauty Boost, which is designed to boost collagen production through a host of superfoods, probiotics, and vitamin C, all of which sustain current collagen and support further production. Oates points out that inflammation is a major cause of skin deterioration and collagen breakdown: she recommends the usual heavy hitters, including dark green leafy veggies, berries, and pomegranate—which are also packed with vitamin C—to combat inflammation. “Both hyaluronic acid and zinc are good additional supplements to further improve collagen production and overall cell function,” agrees Longfield. For a full rating of the best (and worst) collagen-building supplements, stay tuned. We also researched the best supplements for vegans & vegetarians. Plus: your winter survival guide, supplement-style.